On five Wednesday evenings in May, June, and July, Oak Court Mall will be hosting a variety of live music acts, along with food sampling, gift card giveaways, goodies from their merchants, selfie stations, and more! These events will take place from 5-7 PM, and are free and open to the public. Join Oak Court for the 2016 Wind Down Wednesday kick-off! Enjoy live music from Chinese Connection Dub Embassy and sample delicious food from American Wing Company. You could also win a $100 American Express Gift Card from Oak Court Mall! July 13th – Gerald Morgan, Jr. 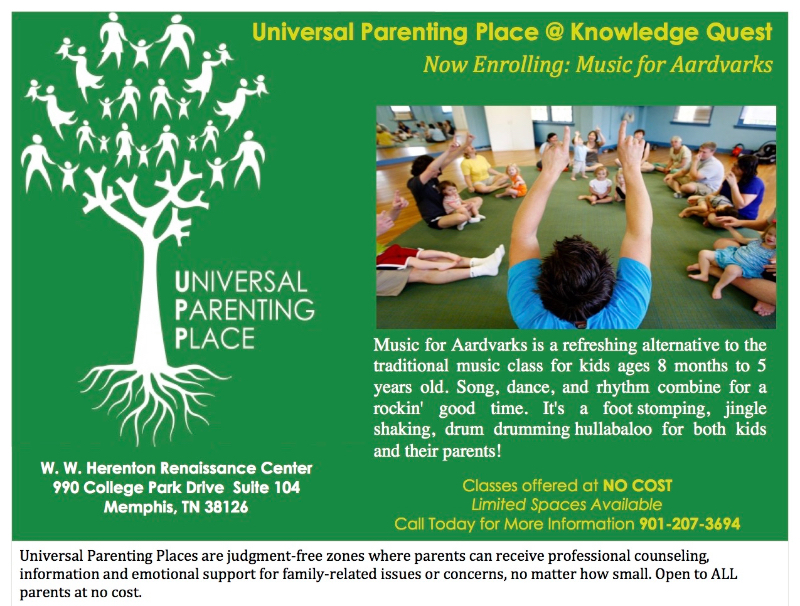 If you have children ages six months to five years, please join us Tuesday, June 30, as Music for Aardvarks presents “Music Class for Little Ones” at the Universal Parenting Place. This event will take place at 11:00 a.m. at our Knowledge Quest site in South Memphis. 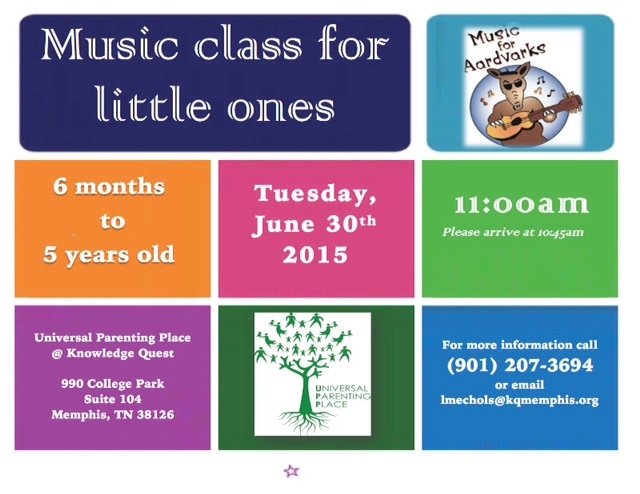 For more information, call (901) 207-3694 or email lmechols@kqmemphis.org. The Oak Grove Baptist church in Memphis, TN located at 7289 Highway is currently seeking qualified candidates who are proficient in playing keyboard and/or organ to become apart of the music staff. Musician will be available for Sunday and Wednesday rehearsals, any additional services (as necessary), and funeral services. The qualified person shall be well versed in all styles of gospel music, contemporary, traditional, hymns, and anthems. The ability to sight read is a plus. Leadership skills in band directing and knowledge of recording are desirable accomplishments that are warranted. Only interested applicants should send a artistic resume to maestrosxj@Gmail.com. The Oak Grove Baptist church in Memphis, TN, located at 7289 Highway 64, is currently seeking qualified candidates who are proficient in playing keyboard and/or organ to become apart of our music staff. Musician will be available for Sunday, Wednesday, rehearsals, any additional services (as necessary), and funeral services. The qualified person shall be well versed with all styles of gospel music, contemporary, traditional, hymns, and anthems. The ability to sight read is a plus. Leadership skills in band directing and knowledge of recording are desirable accomplishments that are warranted. Job Opportunities with LilyRoze Studio. Check them out this Thursday! LilyRoze Studio is opening up Job Opportunities this Thursday at 7pm, 810 S. Main St. Flexible Schedules, It’s a great way to earn extra cash. PLEASE TEXT 901-438-2767 TO RSVP. OPEN TO EVERYONE!